Rail delays, flights cancellations, school closures, “treacherous driving conditions,” freezing weather, ice, sleet, snow and windy conditions in London. 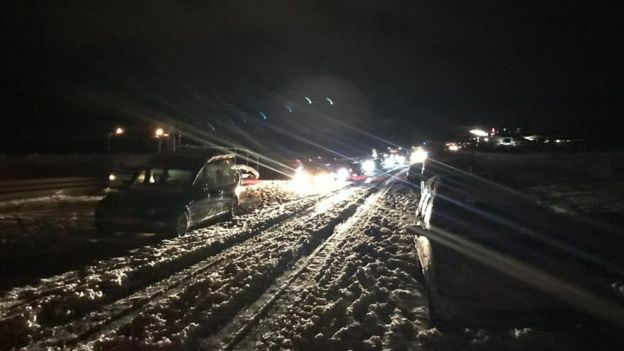 31 Jan 2019 – Heavy snow is sweeping eastwards across the UK, disrupting travel and leaving around 100 drivers stuck on a major trunk road in Cornwall. The freezing weather is moving across southern England and Wales, affecting Wiltshire, Hampshire, Sussex and Kent. The Met Office has warned of “treacherous driving conditions” in some southern areas. There are two yellow warnings in place for snow and ice for large parts of the UK until Friday afternoon. Snow depths of 12cm (5in) have been recorded in Bodmin, Cornwall, the Met Office said. Parts of Cumbria have seen 8cm of snow, while there was 7cm recorded in Inverness-shire and 5cm in Powys. In Braemar, Aberdeenshire, the mercury dropped to -14.5C (6F) on Thursday evening, the lowest temperature in the UK since 2012 – when temperatures fell to -15.6C in Holbeach, Lincolnshire. Fortunately it has dumped on the M4 corridor and the Home Counties. Where the majority of the Green snowflake lefties live, work, and screw up the government based on fake climate news and remoaning to stay in the EUSSR. If they want cooling instead of warming they have to put up with the concequences of a Glacial advance far sooner than when it would have arrived in 1500 years from now. At least the kids get a weekends sledging and playing in the snow. Back to Cold, very windy and wet weather for the next 10 days. Poor, poor David Viner will never live this down. It was a gift that just keeps giving! Sorry to spoil the headline but there has been very little snow in the UK just an incredibly overhyped reaction to an inch of snow that melted in a few hours. This country that I was born in has become a total joke. Going to be a LOT of snow in the Sierra of California. It has to be remembered it was simultaneously cold in the British Isles, the Midwest and East Coast. This lunatic Viner is just another example that you can’t fix stupid! Once an idiot – always an idiot. Just like the Americans who voted for the House in 2018. My corner of the SE missed all the fun. We only had a bit of wet snow that melted away very quickly. Well, the Thames hasn’t frozen over yet. That might be in the next few years. According to Shepherd, Zharkov, Zharkov (scientists), next year will be twice as bad as this year, then 2021 will be twice as bad as 2020! All due to the sun! Rug up, grow your own food as food will spike to many times its prices due to crop failures and stock up with basics!! This has certainly not been one of the more snowy winters in the UK, but recently England had its coldest night for 7 years and Scotland for 9, when it went down to -15 C. The Highlands are well covered in snow above 1000ft or so and the recent snow event in the south of England closed schools, some airports and stranded motorist in various higher lying routes. Most of the colder outbreaks have been due to Polar Maritime air masses from the north west and people in the south east of England have missed the worst.